Crucial.com is a key brand in the Lexar Media family of products. As the Memory Experts™, they're the only DRAM supplier that's part of a major memory manufacturer. They deliver high-quality, award-winning products in every memory category: USB flash drives, all popular form factors of memory cards and card readers, DRAM computer memory for PCs and Mac systems, and solid state drives (SSD). Save on your next memory purchase with discounts, coupons and savings from 58Coupons.com. Rest assured your product will last with Crucial.com's limited lifetime warranty. See site for details. Right now you can save up to 40% on select flash cards from Crucial.com. Click link to save. 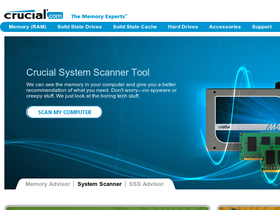 Check out Crucial.com and you can have your system scanned for Free. How much RAM will help your system? Consult the Free memory calculator on Crucial.com. Click link. When you spend $40 or more on Crucial.com, you'll qualify for Free Shipping.